This is one of the more uncommon vintage GRUEN line of watches. 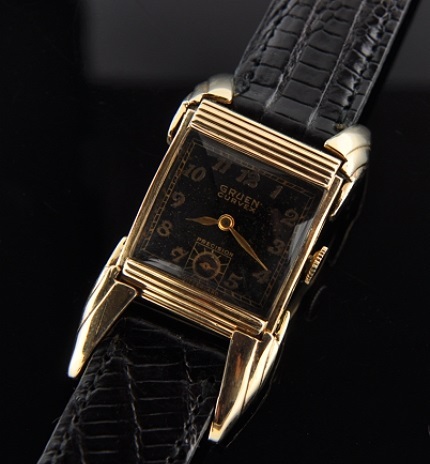 Some call it the ” BAT WING GRUEN” This 1940, art Deco, gold filled GRUEN CURVEX flexible lug driver’s watch is the pinnacle watch for the GRUEN collector. Only the GRUEN DOCTOR’s watch rivals it in price, but actually, the Doctor’s is MORE common to find. The original case measuring 21×49.2mm. (lugs extended) is in good shape for its age. These lugs flex, allowing the user to wear the watch on the side of the wrist while providing easy readability while driving. This watch has an original black dial with original, applied Arabic style numerals. The original GRUEN CURVEX manual winding movement was just cleaned, overhauled and is accurate. $1495.